Dependency injection is a way to remove hard-coded dependencies between objects, making it easier to replace an object's dependencies, either for testing (using mock objects) or to change run-time behavior. This tutorial shows how to perform dependency injection on SignalR hubs. It also shows how to use IoC containers with SignalR. An IoC container is a general framework for dependency injection. Skip this section if you are already familiar with dependency injection. This works, but it's not the best design. If you want to replace FileLogger with another ILogger implementation, you will have to modify SomeComponent. Supposing that a lot of other objects use FileLogger, you will need to change all of them. Or if you decide to make FileLogger a singleton, you'll also need to make changes throughout the application. // Inject ILogger into the object. Now the object is not responsible for selecting which ILogger to use. You can switch ILogger implementations without changing the objects that depend on it. This pattern is called constructor injection. Another pattern is setter injection, where you set the dependency through a setter method or property. Suppose that you want to store chat messages on the server before sending them. You might define an interface that abstracts this functionality, and use DI to inject the interface into the ChatHub class. // Other methods not shown. The only problem is that a SignalR application does not directly create hubs; SignalR creates them for you. By default, SignalR expects a hub class to have a parameterless constructor. However, you can easily register a function to create hub instances, and use this function to perform DI. Register the function by calling GlobalHost.DependencyResolver.Register. Now SignalR will invoke this anonymous function whenever it needs to create a ChatHub instance. In a complex application with many dependencies, you might need to write a lot of this "wiring" code. This code can be hard to maintain, especially if dependencies are nested. It is also hard to unit test. One solution is to use an IoC container. An IoC container is a software component that is responsible for managing dependencies.You register types with the container, and then use the container to create objects. The container automatically figures out the dependency relations. Many IoC containers also allow you to control things like object lifetime and scope. "IoC" stands for "inversion of control", which is a general pattern where a framework calls into application code. An IoC container constructs your objects for you, which "inverts" the usual flow of control. The Chat application is probably too simple to benefit from an IoC container. Instead, let's look at the StockTicker sample. StockTickerHub: The hub class, which manages client connections. StockTicker: A singleton that holds stock prices and periodically updates them. We can use an IoC container to untangle these dependencies a bit. First, let's simplify the StockTickerHub and StockTicker classes. In the following code, I've commented out the parts that we don't need. Remove the parameterless constructor from StockTickerHub. Instead, we will always use DI to create the hub. For StockTicker, remove the singleton instance. Later, we'll use the IoC container to control the StockTicker lifetime. Also, make the constructor public. // Important! Make this constructor public. Next, we can refactor the code by creating an interface for StockTicker. We'll use this interface to decouple the StockTickerHub from the StockTicker class. Visual Studio makes this kind of refactoring easy. Open the file StockTicker.cs, right-click on the StockTicker class declaration, and select Refactor ... Extract Interface. In the Extract Interface dialog, click Select All. Leave the other defaults. Click OK. 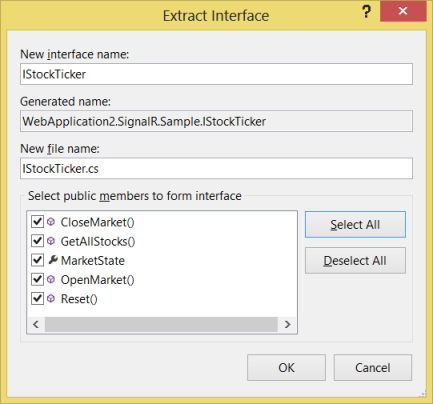 Visual Studio creates a new interface named IStockTicker, and also changes StockTicker to derive from IStockTicker. Open the file IStockTicker.cs and change the interface to public. Creating an IStockTicker interface isn't strictly necessary, but I wanted to show how DI can help to reduce coupling between components in your application. To use Ninject within SignalR, create a class that derives from DefaultDependencyResolver. This class overrides the GetService and GetServices methods of DefaultDependencyResolver. SignalR calls these methods to create various objects at runtime, including hub instances, as well as various services used internally by SignalR. The GetService method creates a single instance of a type. Override this method to call the Ninject kernel's TryGet method. If that method returns null, fall back to the default resolver. The GetServices method creates a collection of objects of a specified type. Override this method to concatenate the results from Ninject with the results from the default resolver. Now we'll use Ninject to declare type bindings. Open your application's Startup.cs class (that you either created manually as per the package instructions in readme.txt, or that was created by adding authentication to your project). In the Startup.Configuration method, create the Ninject container, which Ninject calls the kernel. 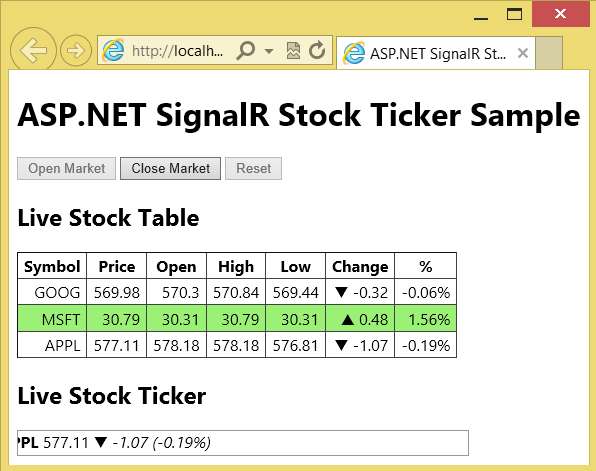 .To<Microsoft.AspNet.SignalR.StockTicker.StockTicker>()  // Bind to StockTicker. .InSingletonScope();  // Make it a singleton object. This code is saying two things. First, whenever the application needs an IStockTicker, the kernel should create an instance of StockTicker. Second, the StockTicker class should be a created as a singleton object. Ninject will create one instance of the object, and return the same instance for each request. This code creates an anonymous function that returns an IHubConnection. The WhenInjectedInto method tells Ninject to use this function only when creating IStockTicker instances. The reason is that SignalR creates IHubConnectionContext instances internally, and we don't want to override how SignalR creates them. This function only applies to our StockTicker class. Now SignalR will use the resolver specified in MapSignalR, instead of the default resolver. Here is the complete code listing for Startup.Configuration. To run the StockTicker application in Visual Studio, press F5. In the browser window, navigate to http://localhost:*port*/SignalR.Sample/StockTicker.html. The application has exactly the same functionality as before. (For a description, see Server Broadcast with ASP.NET SignalR.) We haven't changed the behavior; just made the code easier to test, maintain, and evolve.